On your next vacation, consider staying in. How was your last camping trip? Were there bugs? I bet there were bugs. Did you wake up in a muggy tent, swimming in a puddle of your own sweat, only to unzip the flap and die of hypothermia? How was your last beach trip? Did you sprain an ankle in the soft sand, stumble, then get swept away by a sneaker wave only to get stung by a jellyfish? How was your last picnic? Bugs again? The stinging ones? Did your potato salad sit out in the sun for a minute too long and poison everyone? Bugs. Sunburn. Dirt. Predators. Poop. 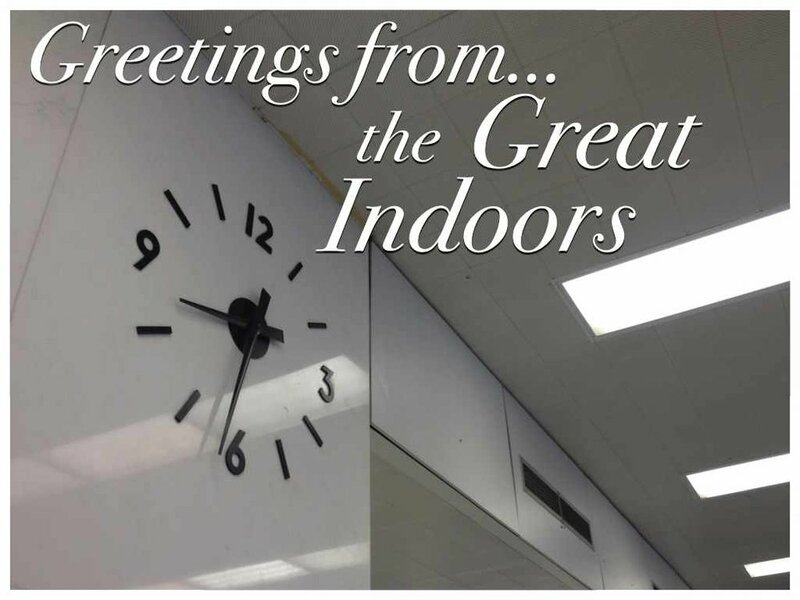 Have you visited the great indoors? Relax in a comfortable chair beneath the gentle hum of efficient fluorescent lighting. The gentle breeze drifting from the air conditioning will cool and comfort you as the thick, sturdy walls and ceiling protect you from the angry sun’s harmful radiation. There’s no reason to be bored indoors. Watch a movie, read a book, play a game, or have a snack. Whenever that runs out there’s always time for internet. Not finished reading your book when the sun goes down? Turn on a light. Now you want to watch a scary movie? Turn the light off. You’re in control here. What’s the weather? Who cares. Go ahead and nudge that thermostat up a degree or two. You deserve it. Because the worst part of the great indoors is going outside.